Blog - What is Service Fee? Q. What is Service fee? A. That fees is from payment gate, they provide us solutions to sell and they charge us hugh fees, we have to share to our customer as a help. Service fees will be updated when you select each payment method. Q. How much i have to pay? 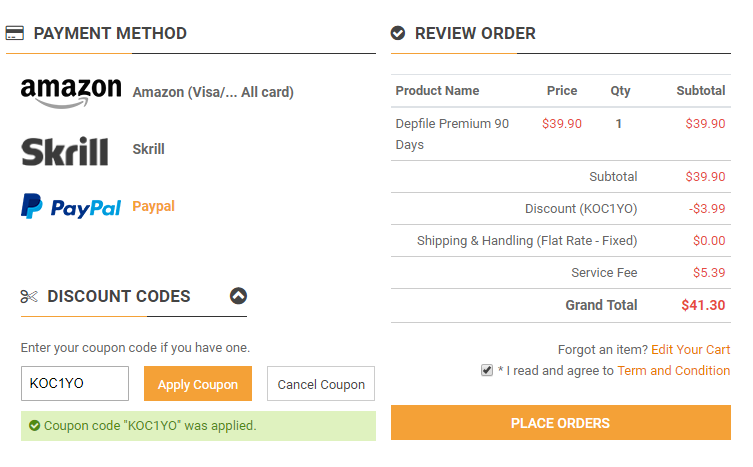 Example, you want to buy Depfile Premium 90 Days which has price is $ 39.90, and you have an promotion code is KOC1YO (discount 10% to happy KeyOneClick 1 year old), and select paypal as payment method. KeyOneClick reseller ensure support premium key / premium account low price with low fee transaction. If you have any questions, don't hesitate contact us!